I love Italian food. But, as my recent trip to Puglia demonstrated rather too absolutely, it’s very easy to end up eating FAR too much of it and completely wrecking any intentions of following a diet. Now, of you could dine on steak and pasta – decent sized portions – and know that you could still stick to your diet, or at least not blow it completely wouldn’t you do so? 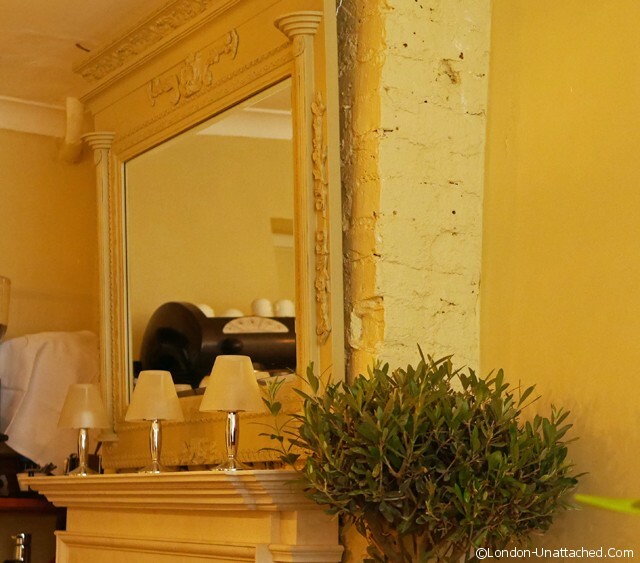 Well, La Tagliata, round the corner from Liverpool Street will let you do just that. The restaurant itself is a light contemporary refurbishment of a listed building. The restaurant owners have turned a maze of small dining rooms into quirky spaces where you can chose the level of privacy you want to enjoy. Perfect for a working lunch or for birthday celebrations, I can see the place getting to be very busy at Christmas time. The rooms all have names too and just little touches to tell you where you are..from the Dispensa (pantry) to the Cantina (wine cellar). Back though to what is really important – the food. We learnt that the relatively concise menu was a deliberate strategy. We learnt that buratta would be on the menu next week and that more dishes would be added gradually. But for now it’s a the modest but perfectly formed menu created by head chef Antonio Tonelli and team. 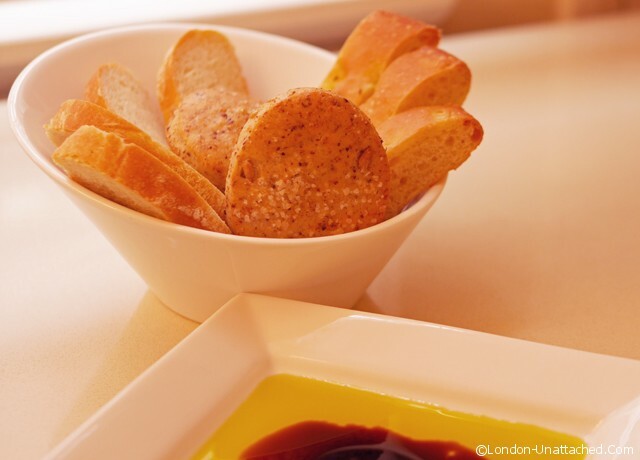 There’s home made Italian breads, a choice of three sauces for the tagliatelle starter and la tagliata or scamorza for your main course. Add to that a couple of dessert options, a very refined Italian wine list and some options for those who prefer soft drinks. The bread was light and very fresh. We went on to try all three of the pasta sauces and honestly couldn’t pick a winner from the pomodoro, pesto and creamy limone. Perfectly al dente pasta with balanced simple sauces. 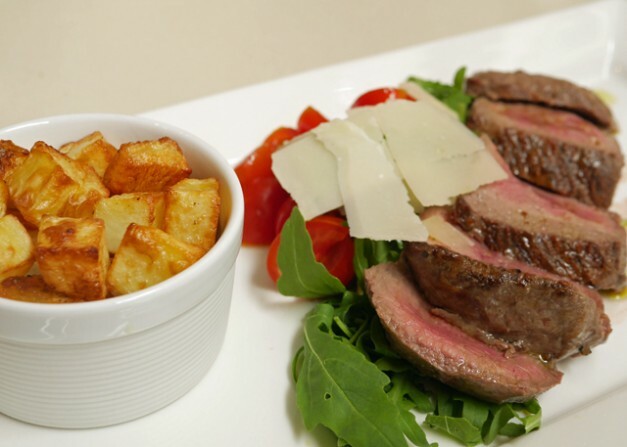 La Tagliata itself, an Italian style sirloin served with rocket, parmesan, cherry tomatoes and balsamic reduction, is a Tuscan dish. And it’s one I’ve enjoyed on several occasions before. Here it was beautifully cooked and served with the option of roast or shepherd potatoes. Desserts of course, were Italian classics and once again impeccably presented. 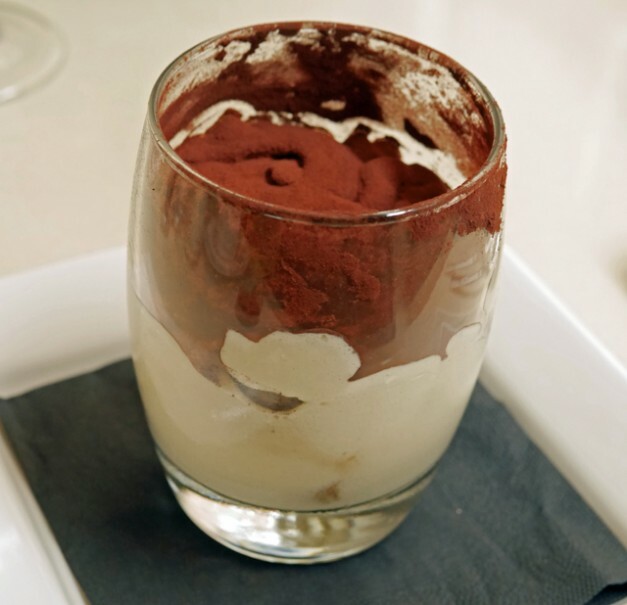 Tiramisu and caramel panna cotta; who could ask for anything more? The challenge for La Tagliata now is not in the proposition; for me that was pretty perfect. 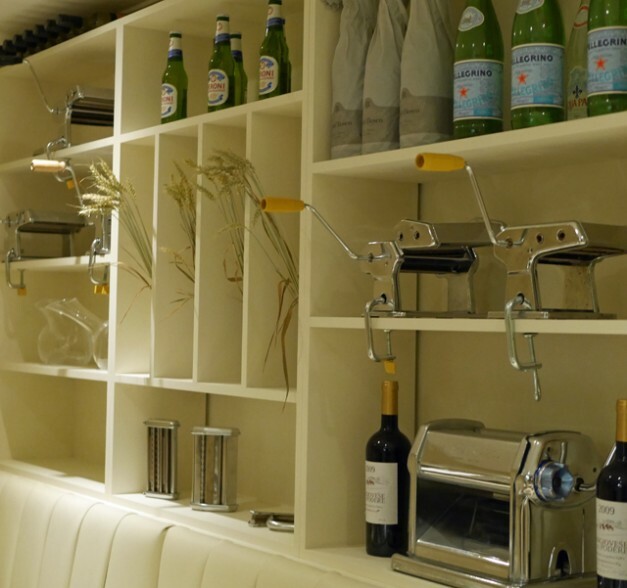 The challenge is that in an overcrowded London food scene, this neat, tidy Italian restaurant tucked away in a side street round the corner from Liverpool Street Station needs to be discovered. With keen pricing – just £24 for two courses and with good quality wines starting at £18 a bottle, it deserves to succeed. So I shall certainly be back. Even if it does means I have to eat more steak…safe in the knowledge I can enjoy my meal for 650 calories (with perhaps a few hundred calories extra for a glass of wine or two). thought I had commented (if so please delete this duplicate!) 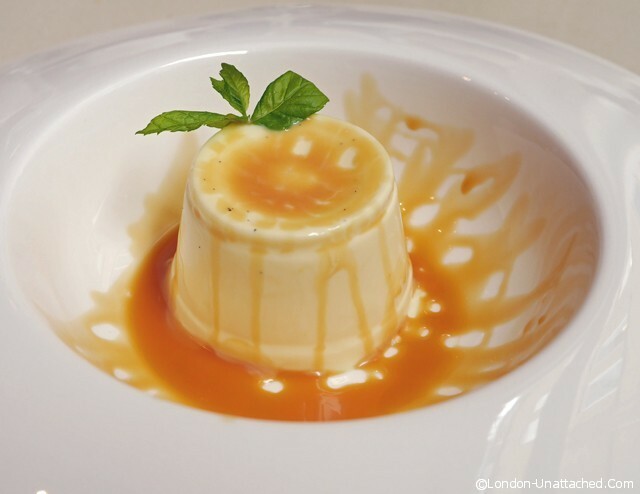 – lovely meal and a great selection for the calorie content! love the idea of all thse small dishes and agree with the others it seems a lot of food for 650 kCals – delicious! the calorie count doesn’t include bread, wine and dessert…but all the same, it means you can eat out and not completely blow your diet! 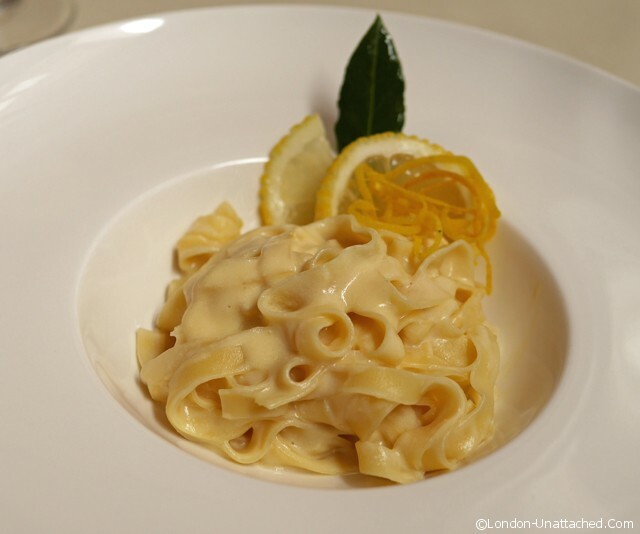 That creamy limone tagliatelle looks delicious! And it seems like really good value too. The restaurant and the food looks great but really can you eat all that and it adds to 650 calories?? Not sure how you only get 650 calories with that lot Fiona, but it sure looks delicious. so is there ‘thing’ that the cals are low? cos otherwise those portions look tiny!! the sauce for the pasta is very light and the tagliata is grilled rather than pan fried. The portions in my pictures for the pesto and pomodoro pastas are half size because they wanted us to try all three sauces between two!